Huge complexes of interstellar gas and dust left over from the formation of galaxies, called molecular clouds, are composed mostly of molecular hydrogen. These clouds are the coolest (10 to 20 K) and densest (106 to 1010 particles/cm3) portions of the interstellar medium. 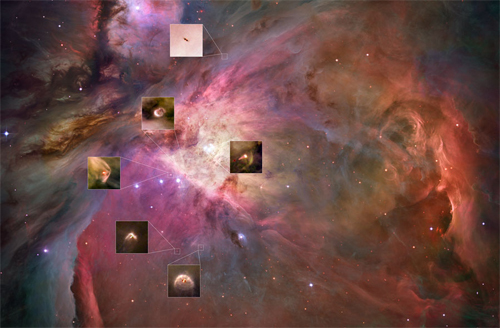 Since these clouds are cooler than most places, they are perfect locations for star formation. The molecular clouds are puffy and lumpy, with diameters ranging from less than 1 light-year to about 300 light years (LY) and contain enough gas to form from about 10 to 10,000,000 stars like our Sun. Molecular clouds that exceed the mass of ~100,000 suns are called Giant Molecular Clouds (GMC's). A typical spiral galaxy contains about 1,000 to 2,000 Giant Molecular Clouds and many smaller ones. These clouds were first discovered in our Milky Way Galaxy with radio telescopes about 30 years ago. Since the molecules in these clouds do not emit optical light, but do release light at radio wavelengths, radio telescopes are necessary to trace the molecular gases and study their physical properties. 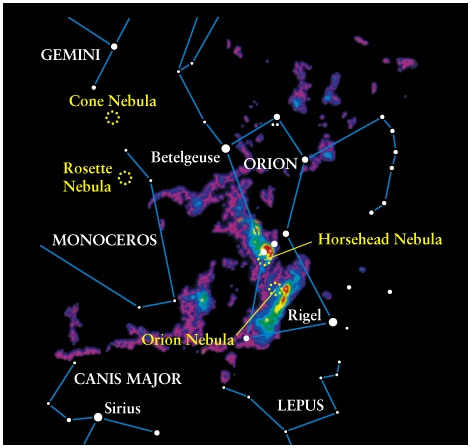 The image above shows the location of the GMC in the region of Orion – produced by radio mapping of carbon monoxide (CO) gas. Star-forming molecular clouds are mostly found along spiral arms, as seen in the CO molecular map showing the distribution of these clouds in the Milky Way Galaxy. Individual giant molecular clouds are internally violent and turbulent. The self-gravitational energy of the clumps is counter-balanced by pressure from both the supersonic velocity of the gases and magnetic field lines. Pertubations from spiral density waves within the spiral arm structure, collisions between nearby clouds, supernova shockwaves, and nearby massive star formation are some of the possible triggers that eventually cause an imbalance within the GMC's and the clumps begin to collapse. Individual stars within clumps form within their own smaller gaseous structures, called cores. As a gas core collapses it heats up due to friction as the gas particles bump into each other. The energy the gas particles had from falling under the force of gravity (gravitational potential) gets converted to heat (thermal) energy. The gas cores become warm enough to produce infrared and microwave radiation. During the initial collapse, the core is transparent to radiation and the collapse proceeds fairly quickly. As the core becomes more dense, it becomes opaque. Infrared radiation is trapped, and the temperature and pressure in the center begins to increase. As the core starts evolving into a protostar, it only has about 1% of its final mass; however the envelope of the star continues to grow as infalling material continues to accrete. After a few million years, the temperature at the center of the core is hot enough for hydrogen fusion to begin, and a strong stellar wind is produced which stops the infalling of more material. Other material in the disk may coalesce to form other stars and/or planets. Protostars reach temperatures of 2000 to 3000 K - hot enough to glow red - but the cocoon of gas and dust surrounding them blocks visible light from escaping. Proplyds are protostars embedded within protoplanetary disks. The close-up oftwo of these young disks in Orion reveals the torturous conditions involved in transitioning from protostars into stars and planetary systems. Ultraviolet radiation from one of Orion's nearby hot stars is rapidly destroying the disks surrounding the protostars. Only ~10% of all protostars survive the harsh conditions within stellar formation regions to become stars.